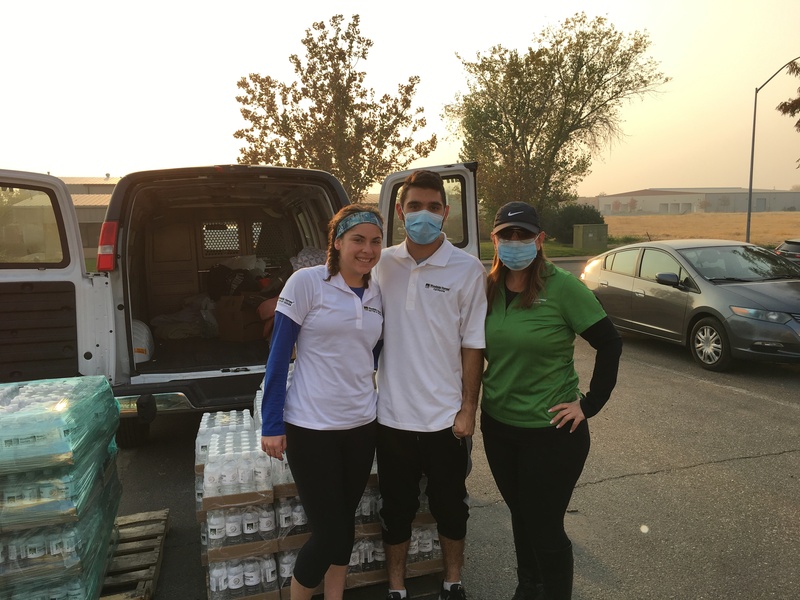 In the wake of the Camp Fire that devastated Paradise, CA, Woodside Homes’ Northern California Division employees collaborated to provide aid to their neighbors to the north. They collected clothing such as jackets, socks, slippers, shoes, and underwear, in addition to blankets, pillows, cots, yoga mats, and diapers to donate to evacuees in advance of Thanksgiving. This division of the national homebuilder, which is headquartered in Utah, also provided Safeway and Visa gift cards to evacuees staying in Folsom area hotels who are partnering with the Folsom Chamber of Commerce to provide accommodations. Toni Turnbull, marketing manager of Woodside Homes’ Northern California Division, and her son and his girlfriend drove 115 miles to Chico on November 18 to deliver the goods to various collection centers and temporary shelters. In addition to the two Salvation Army locations, they visited a Walmart shopping center in Chico that has sheltered evacuees to deliver fresh coffee and blankets. Turnbull had the opportunity to interact with several fire victims who left quite an impression about how basic their needs are. Woodside Homes, one of the top 30 homebuilders in the U.S., is celebrating its 41st year in the business of designing and building single-family homes for move-up and entry-level buyers. In 2017, Woodside Homes was acquired by SEKISUI HOUSE, one of the world’s largest homebuilders. The two companies joined forces with their shared philosophies in creating sustainable communities that grow and adapt to the needs of today’s homebuyers. Founded in 1960, SEKISUI HOUSE has constructed more than two million homes. Based in Osaka, it has approximately 90 subsidiaries and affiliates, 23,000-plus employees, and is listed on the Tokyo Stock Exchange and Nagoya Stock Exchange. Since 1997, SEKISUI HOUSE has positioned its commitment to the environment as a core management target and provided numerous environmentally and sustainably conscious products as a front-runner among industrialized housing manufacturers. Woodside Homes is dedicated to being “Better by Design,” delivering an exceptional experience to every customer and acting as a trustworthy, knowledgeable guide throughout the home buying process. Woodside has sold more than 43,000 new homes since inception, and according to Hanley Wood data, it is the 27th largest homebuilder in the United States. The partnership with SEKISUI HOUSE allows Woodside Homes to evolve and adapt cutting-edge methods in sustainability and efficiency practices. For more information visit http://www.woodsidehomes.com/.